It is officially spring tomorrow and I am feeling the need to celebrate - these super simple homemade musical instruments have been perfect for Skyler to cheerfully welcome the warmer seasons and they are a fun reminder of one of our favorite times of the week! In our Kindermusik class, the little one's have had the opportunity in the past few weeks to try a ton of new instruments. 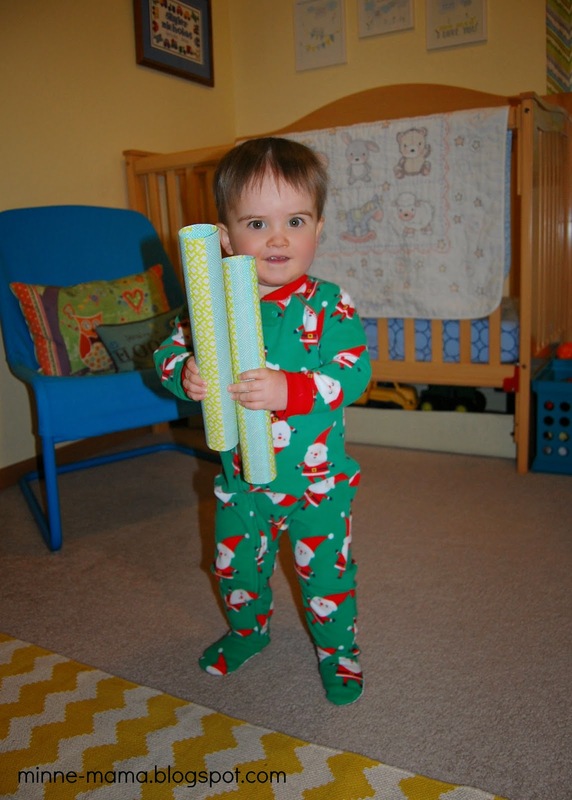 Skyler's favorite was a set of plastic percussion tubes (if you Google that you can find the name they go by). This version used recycled materials we had on hand and they sound just as good as the ones you can buy - and are much more budget friendly! 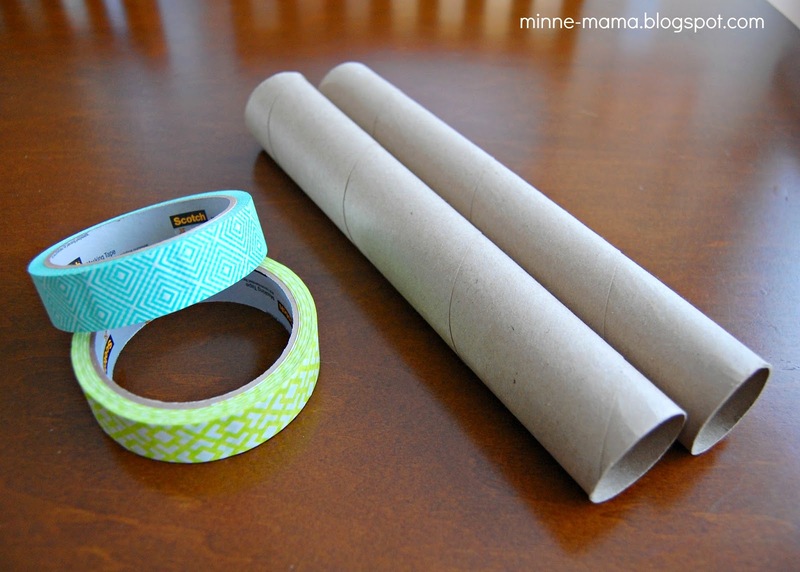 All you need to create this incredibly entertaining musical instrument is two paper towel rolls and some tape. 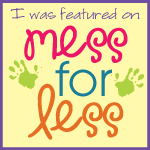 I used masking tape with bright spring-like colors and geometric shapes. 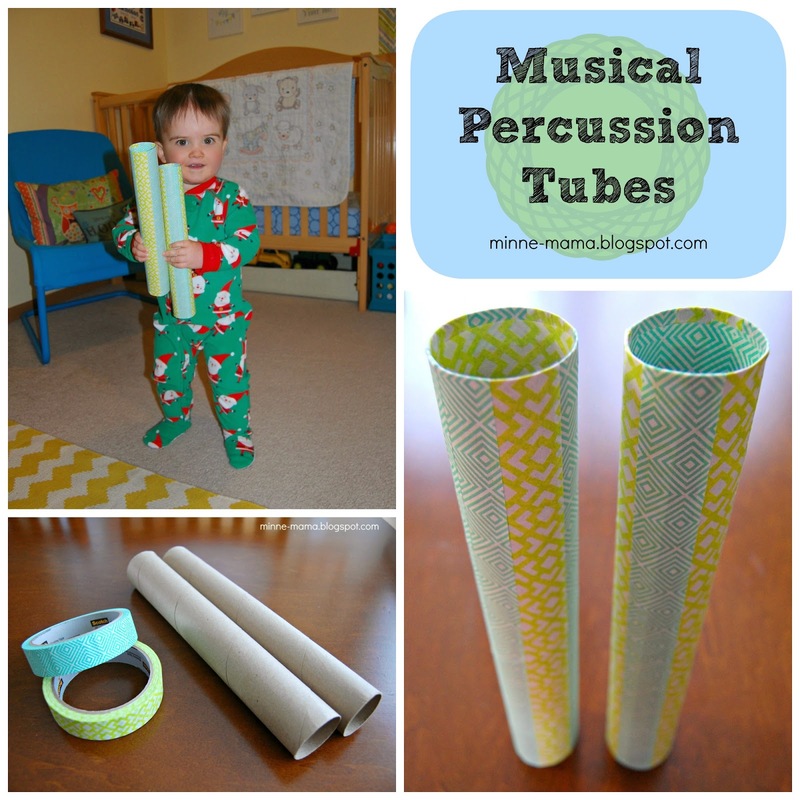 You could use any variety of color or patterned tape to create these beautiful instruments. 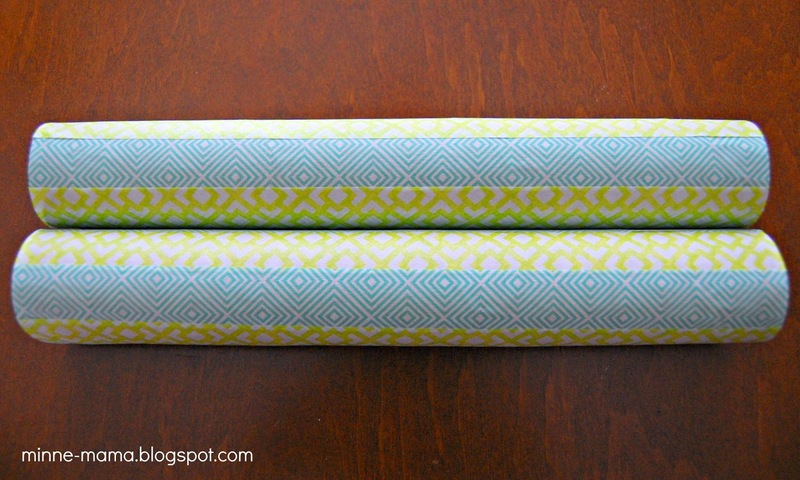 To make the tubes, I laid the paper towel roll down and pulled out a piece of tape long enough to cover the length of the roll. Then I stretched the tape tight and placed it down in one piece when it was as straight as possible. I tucked the end pieces into the tube and when I had gone all around the roll I cut a piece big enough for the inside so that it was one continuous piece of tape instead of all the different length ends showing. I tried doing some horizontal pieces of tape along the tube, but ended up liking the look of just the vertical stripes instead! Doing all horizontal, checkered with vertical and horizontal, or even diagonal stripes with the tape would look great as well, it would just take longer to match up the tape straight. Making our musical percussion tubes only took me about five minutes, including the tape I ended up taking off. They are quite easy once you figure out how to keep the roll from spinning as you press down the tape. When I was done, I tried them out and they sounded great. I actually hit them pretty hard against the table and they didn't lose their shape at all - quite toddler proof! 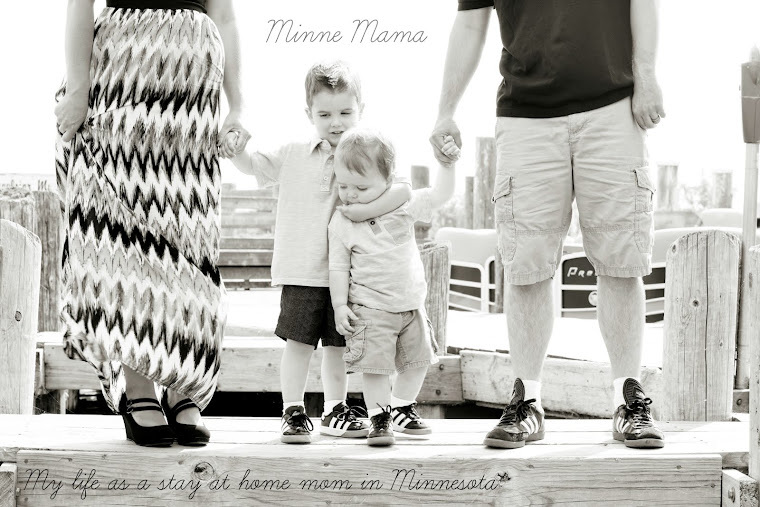 I was really excited to have Skyler play with these. Skyler saw them and when I banged them together once, he knew what they were and was so ready to play! I had planned on getting some pictures in the morning, but he was so eager to play his new instruments and was using them very creatively, so I grabbed the camera just minutes before bedtime - poor lighting, pajamas, and everything - so I must apologize for the not-so-beautiful pictures! Between the darkness and movement I had to use a flash. You know what screams spring? That would be fleece Santa Claus pajamas of course! ;) Skyler insisted on his "Santa jammies!" 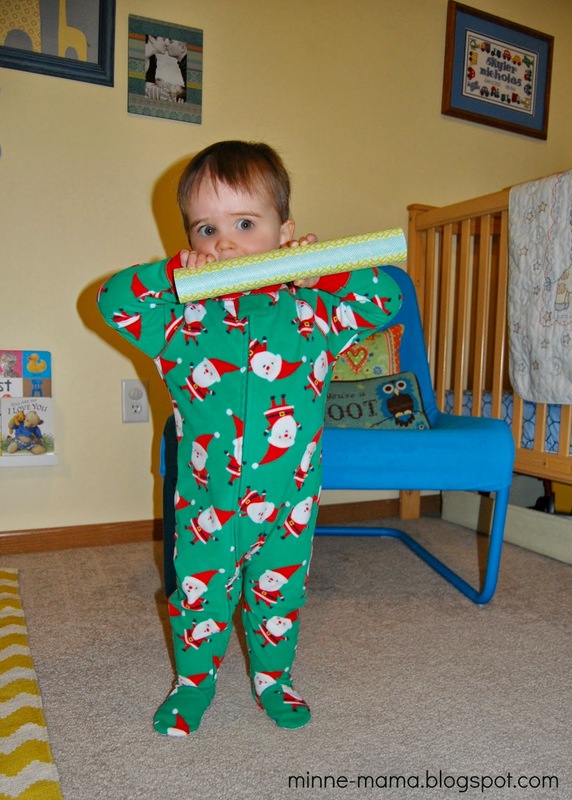 and you better believe they will be in his nightwear rotation until he outgrows them or it gets too warm for fleece. Anyone else still rocking the Christmas pajamas? I thought this was too funny. 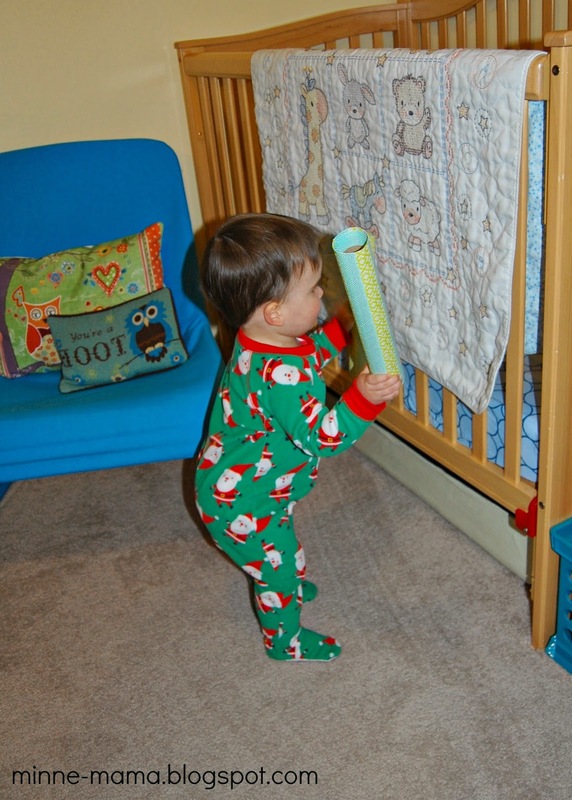 Skyler using a tube as a harmonica - sound effects and all! Of course, Skyler tried banging his instruments on all the surfaces in his room. We talked about what made loud noises and what made quiet noises. We were playing with them while listening to a CD from our music class and it is all about vehicles. 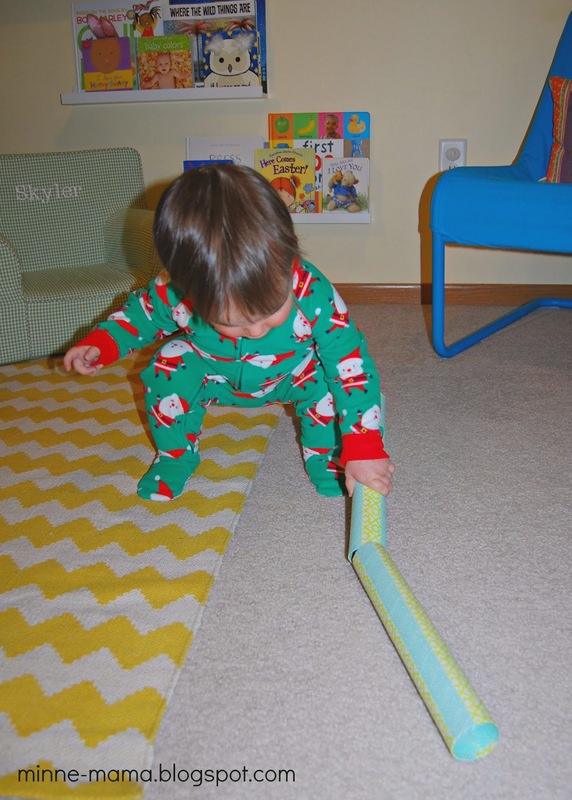 Skyler is using the two tubes to make a train in this picture! "Choo Choo!" 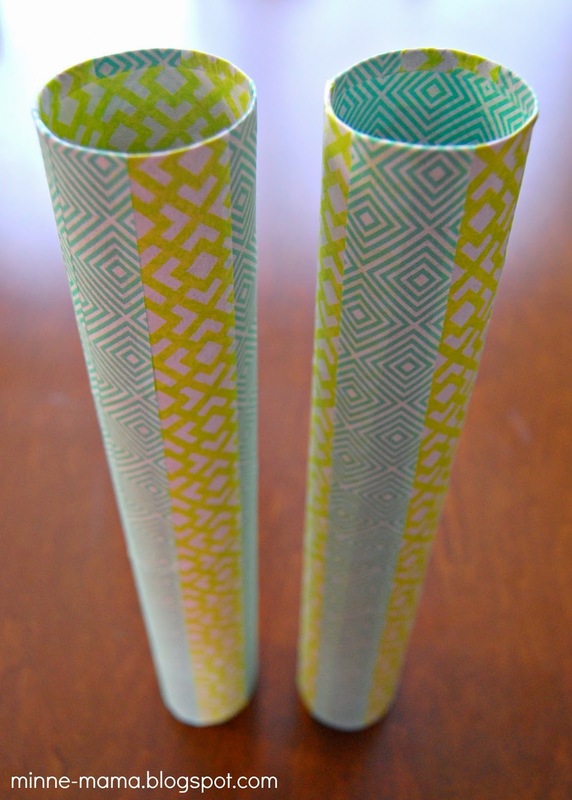 These musical percussion tubes are simple and fun to make, and are a great way to use the empty paper towel rolls we always seem to have laying around. I am sure we will make a few more sets of these fun instruments to play with!